Webcams have many uses, from staying in touch with friends and family in far flung corners of the world to rigging them up for home surveillance or attending online business meetings. If you’re looking for a webcam for video calling, whether it’s for business or pleasure, then you’ll want to ensure that your picture and sound quality is as clear as can be. Our HP webcams are HD quality and come with a built in microphone, so you don’t have to worry about setting one up separately. They also come Skype certified, meaning they’re perfect for video calls with frame lag or distortion. 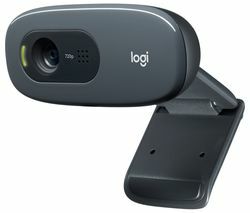 Our Logitech webcam collection has a good range of webcams to suit all budgets. 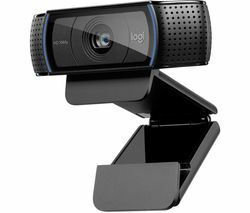 If you’re looking for a cheap webcam then the Logitech C270 is a brilliant buy, coming in HD with a 1280 x 720 resolution, a built in microphone and a photo button too. At the top end of the spectrum is the Pro C920 Full HD, with a 1920 x 1080 resolution and a built in microphone too. Whether you’re looking to upgrade your current webcam, or add one to your home computer setup, our range of webcams have the right product for every occasion.